Be the first to share your favorite memory, photo or story of Dorothy . This memorial page is dedicated for family, friends and future generations to celebrate the life of their loved one. 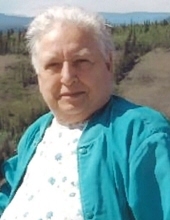 Dorothy Watson Burke, 81, widow of Arthur Leroy Burke, passed away Friday, March 22, 2019 in Augusta Health. Mrs. Burke was born on November 30, 1937 in Alleghany County, a daughter of the late Wilbur Harris and Dolly Lee (Peters) Andrews. Dorothy was retired from Western State Hospital as a nurse’s aide. She enjoyed traveling, gardening, and loved animals. In addition of her parents and husband she was preceded in death by four brothers, Donald Andrews, Charles Knicely, Warren Knicely, and Dennis Andrews. Surviving are her children Peggy Burke Sensabaugh and her husband Norman, Betty F. Crigler and her husband Curtis, both of Churchville, Jeffrey Allen Burke and his wife Sue of Staunton, and Scott Burke and his wife Shelly of Churchville; sister, Mackie Brown and her husband Buck of Staunton; sister-in-law, Delores Andrews of Millboro; six grandchildren, Leslie Harris and her husband Greg, Levi Fischer and his wife Jacquelyn, Steven Burke and his wife Kayla, Lindsey Burke, Noah Burke and his wife Cassie, and Cody Burke; seven great-grandchildren, Zayden Harris, Zachary Harris, Lennon Burke, Gracie Burke, Beth Burke, Elijah Burke, and Jace Fischer. The family will receive friends one hour prior to service. A Celebration of life will be conducted 11:00 a.m. Monday, March 25, 2019 in the Coffman Funeral Home Chapel by Pastor Denny Sites. Memorial contributions may be made, in Dorothy’s memory, to Churchville Volunteer Fire and Rescue, Post Office Box 608, Churchville, Virginia 24421. To send flowers or a remembrance gift to the family of Dorothy Watson Burke, please visit our Tribute Store. "Email Address" would like to share the life celebration of Dorothy Watson Burke. Click on the "link" to go to share a favorite memory or leave a condolence message for the family.